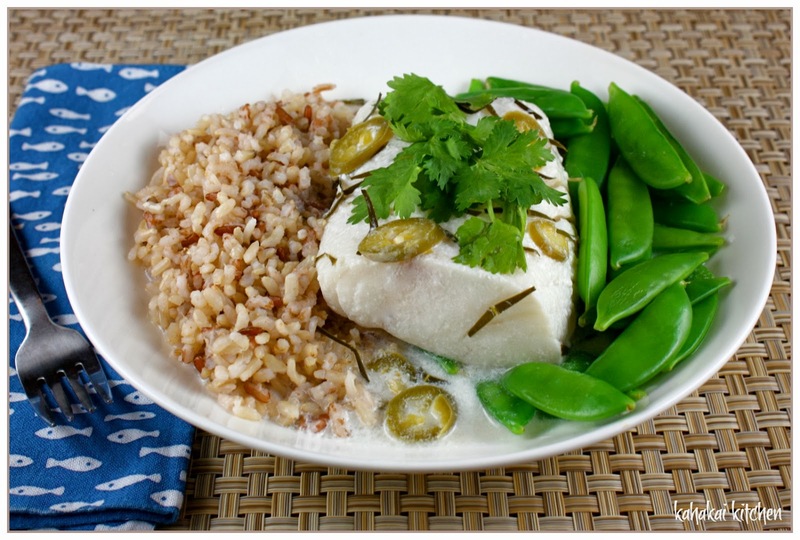 This Lime and Coconut Poached Fish from Fast, Fresh Simple is what Donna Hay says she cooks on "summer beach holidays" and that when she cooks it at home, her "thoughts return to the beach." 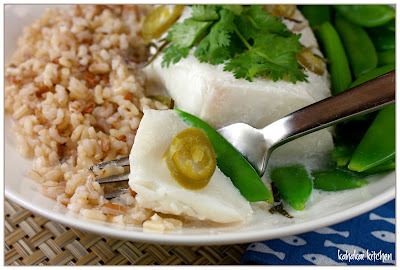 I love the tropical feel of the dish from the fresh (local) kaffir lime leaves, lime juice and coconut milk and served here with gingered 'volcano' rice (brown and red rice grown on the mineral-rich volcanic soil of West Java) and steamed sugar snap peas. Place the coconut milk, chilli, lime juice, kaffir lime leaves and fish sauce in a pan over medium-low heat. Bring to a boil, reduce heat and simmer for 4 minutes. Add the fish and cook 3-4 minutes each side or until tender. To serve, divide the fish the fish and poaching liquid between serving plates and sprinkle with coriander and serve with steamed rice and greens. Notes/Results: A great combination of flavors--tangy, spicy and sweet. The fish (I used frozen cod) is tender and moist and the coconut 'sauce' soaks into the rice nicely, giving it even more flavor. 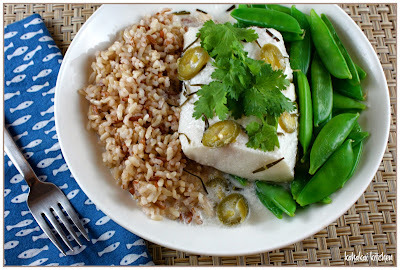 I made my volcano rice in the rice cooker, tossing in some minced ginger and steamed the sugar snap peas--making sure they were plenty crisp. This makes for an easy and satisfying meal that isn't too heavy. I would make it again. 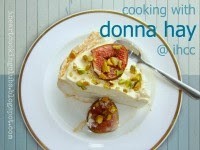 It's Tropical Delights week at I Heart Cooking Clubs--making delectable Donna Hay recipes with tropical ingredients. You can see what everyone made by checking out the picture links on the post. 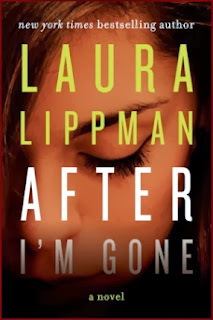 There is a certain symmetry to the fact that this is my 35th turn as a TLC Book Tour Host and the book that I am reviewing is the latest novel from Laura Lippman, the author of my very first TLC book tour. My review for Lippman's novella "The Girl in the Green Raincoat" posted February of 2011, was my introduction to her books and since then I have enjoyed several of her other books. After I'm Gone is her newest novel, a character-driven mystery that quietly builds suspense by weaving a story that spans decades in the life of a family, while following a retired detective tasked with working cold cases and determined to solve an old murder. "When Felix Brewer meets Bernadette “Bambi” Gottschalk at a Valentine’s Dance in 1959, he charms her with wild promises, some of which he actually keeps. Thanks to his lucrative—if not all legal—businesses, she and their three little girls live in luxury. But on the Fourth of July, 1976, Bambi’s comfortable world implodes when Felix, newly convicted and facing prison, mysteriously vanishes. Somewhere between the secrets and lies connecting past and present, Sandy will find the truth. And when he does, no one will ever be the same." The book starts out with the 1976 disappearance of Felix Brewer before jumping to 2012 when detective "Sandy" Sanchez, looking for the next cold case to spend his time on, opens an 800-page file and becomes intrigued by the murder of Julie Saxony. Saxony, a former exotic dancer and the girlfriend of Felix Brewer, was presumed to have left to join him ten years after he escaped prosecution--until her body was discovered in a Baltimore park in 2001. The story then goes back and forth between present day and the past--from Felix meeting his wife, Bambi, in 1959, and through the ensuing years, showing the effects Felix's choices and his fleeing had on his wife, three daughters and his mistress. The book started out a bit slow for me, there were a lot of characters to keep track of and the alternating time periods had me going back to the beginning of the chapters to remind myself where we were at. I also found many of the characters somewhat unlikeable and thus hard to attach to for the first half of the book. After I'm Gone, required some patience to "peel back the layers" of the characters and discover their secrets and the motivations for their behavior but it was worth it--the second half has plot twists and turns that ratchet up the suspense. I like it when I am convinced I am right about whodunnit and the whys behind it and then things change and I end up surprised at the end. Lippman definitely achieved that element of surprise for me and made the book well-worth the slower start. Lippman fans, readers with the patience to let a mystery unfold, and lovers of character-driven novels and family dramas will enjoy this book. Author Notes: Laura Lippman grew up in Baltimore and returned to her hometown in 1989 to work as a journalist. After writing seven books while still a full-time reporter, she left the Baltimore Sun to focus on fiction. The author of two New York Times bestsellers, What the Dead Knowand Another Thing to Fall, she has won numerous awards for her work, including the Edgar, Quill, Anthony, Nero Wolfe, Agatha, Gumshoe, Barry, and Macavity. And now for the food... There is some food presence in After I'm Gone. 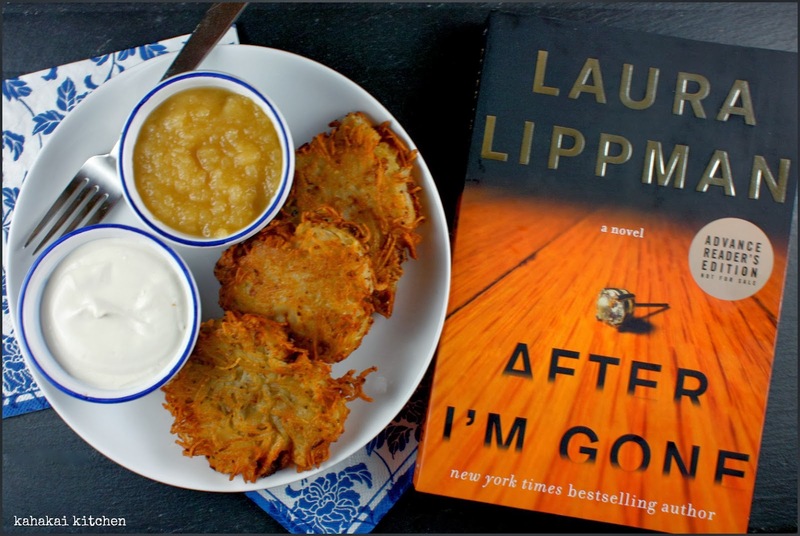 Even if Baltimore doesn't seem to be a particularly inspiring food mecca, I get the feeling from her books that Lippman is at least bit of a foodie. Food mentions mainly range from the catered fare at events like weddings, parties, and a bat mitzvah, to traditional Jewish dishes at family get-togethers and holidays. Detective Sandy seems to hit a lot of diners, Howard Johnsons and the occasional Subway, although he had his own Cuban restaurant that failed and longs for a good Cubano sandwich. Latkes appeared a couple of times in the book and finding it hard to resist fried potatoes of any kind, I decided to make a small batch of these pancakes as my dish inspired by the book. Latkes are traditionally cooked on Hanukkah to commemorate the miracle of the menorah oil in the Jewish Temple. 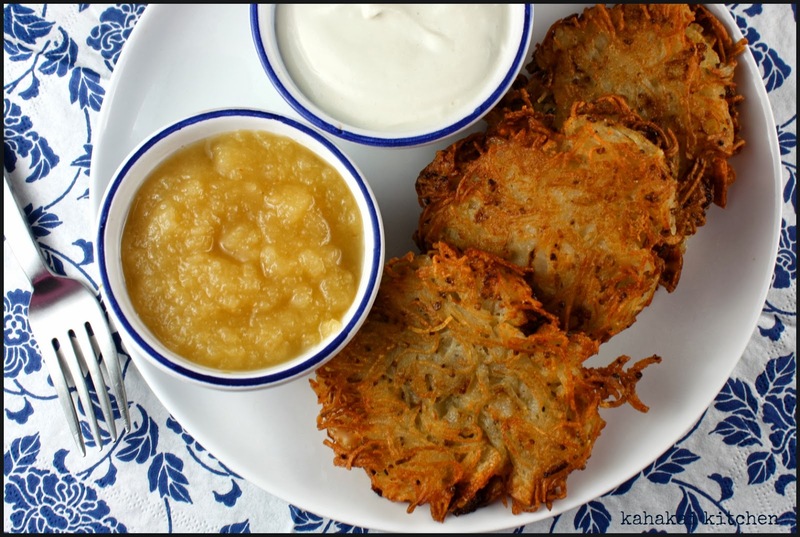 Latkes are traditionally made from potatoes (shredded), with eggs, onions and salt. Sometimes herbs/spices are added for flavor and Matzo meal, breadcrumbs or flour may be added in to help bind everything together. 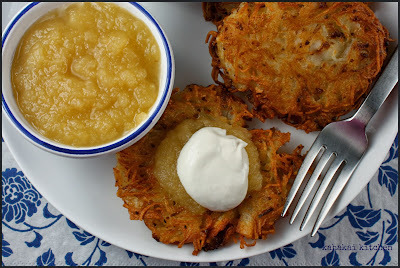 I didn't go traditional with my latkes--choosing an easy vegan recipe from Vegetarian Times--mainly because I forgot to buy more eggs. 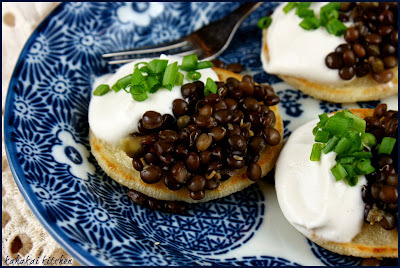 ;-) I served them with a little applesauce and leftover vegan sour cream (from these Blinis with Beluga Lentil 'Caviar' and Cashew Sour Cream) as the recipe suggested. 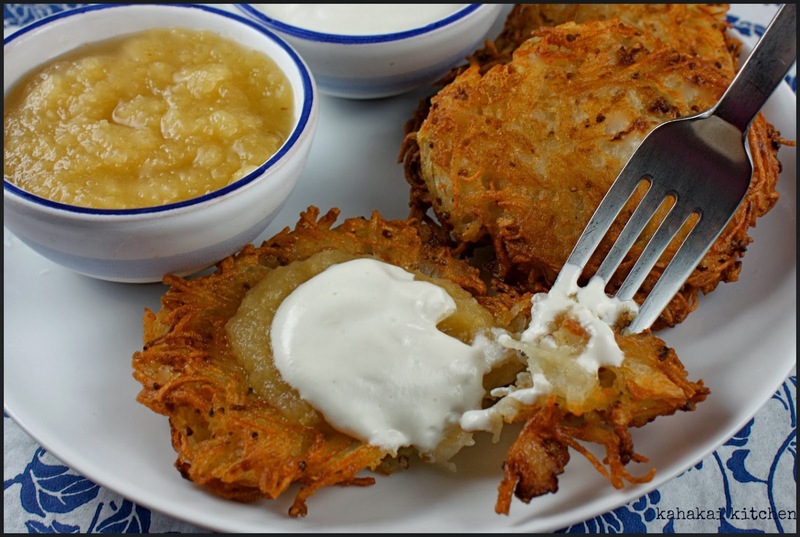 Vegetarian Times says, "Jason Johnstone-Yellin created this vegan version of potato pancakes after his Jewish wife kept saying "they're not as good as my mom's." Now he's working on a vegan cookbook: Cooking with Tamara's Husband." Heat 1 tablespoon oil in large skillet over medium heat. Scoop 1/2 cup potato mixture into skillet and spread into 1/8-inch thick patty. Repeat. Fry patties 3 to 4 minutes per side, or until golden brown. Cook remaining latkes in batches of 2, adding 1 tablespoon oil to skillet each time. To drain, transfer latkes to wire rack on top of baking sheet lined with newspaper. 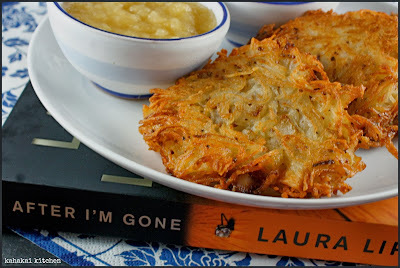 Place latkes on pan in oven to keep warm. Serve with vegan sour cream or applesauce. Notes/Results: I was really pleased with how these turned out--perfectly crisp--especially around the edges and they tasted great. For my first latke-making, I think I did pretty well. ;-) Not traditional of course--but, the stone ground mustard added a nice layer of flavor that contrasted nicely with the sweet applesauce and slightly tart cashew sour cream. I used my spiralizer (cutting the potato so it would make short 'strings') and I think the super-thin shreds made them even crispier. They actually held together quite well. I used my ice cream scoop and packed the mixture into it, flattening them with the spatula when they hit the pan. I used one large baking potato and 1/2 an onion and it made 5 good-sized patties. I would definitely make them again. Note: A review copy of "After I'm Gone" was provided to me by the publisher and TLC Book Tours in return for a fair and honest review. I was not compensated for this review and as always my thoughts and opinions are my own. 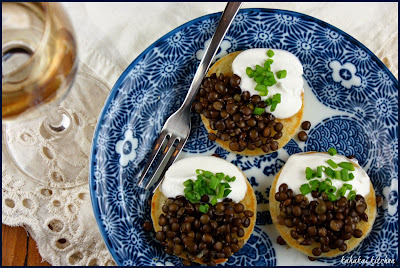 Beluga Lentil 'Caviar' with Cashew Sour Cream on Blinis--A Veg-Friendly Take on 'Blini Demidoff au Caviar' for Food 'N Flix February: "Babette's Feast"
Babette's Feast the 1987 Danish film based on a story by Isak Dinesen is often called the pinnacle of foodie movies and it's our Food 'N Flix February movie, hosted by Camilla of Culinary Adventures with Camilla. It has been years since I watched this movie and watching it again reminded me of it's simple grace and beauty. "Throughout the world sounds one long cry from the heart of the artist: Give me the chance to do my very best." 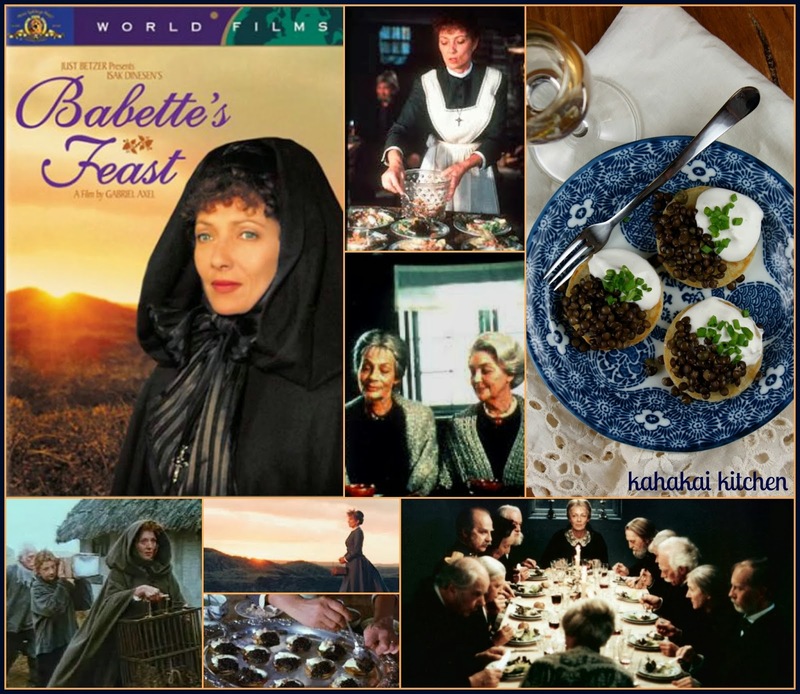 Set in 19th century Denmark, Babette's Feast is the story of two adult sisters, the daughters of the leader of a fairly austere, pious church sect in a small village. Since their father's passing, the daughters serve the church and its elderly congregation living simply and doing good works. Babette, a French woman, shows up on their doorstep asking for refuge and they take her in as their cook and housekeeper. After many years of service, Babette wins a large sum of money and asks the sisters if she may cook them "a real French meal" for the supper they are having to honor what would have been their father's 100th birthday. They somewhat reluctantly agree to let her purchase the ingredients and cook the dinner but, they have concerns about what this decadent supper says about their faith and spiritual principles. I won't say more than that because I love the way the story unfolds and I think you should just rent, stream, or buy it and watch this wonderful film. Babette's Feast is full of food--from the not-so-appetizing soup of brown bread and ale and the dried fish that seems to make up the basic diet of the congregation, to the incredible dinner that culinary artist Babette creates for her guests of turtle soup, blini with caviar and sour cream, baby quail in pastry, endive salad with walnut vinaigrette, a gorgeous cheese and fruit plate, a beautiful cake with glacéed fruits and several fine wines and champagne. I decided to do a veg-friendly version of Babette's 'Blini Demidoff au Caviar'--the buckwheat blini topped with caviar and sour cream. 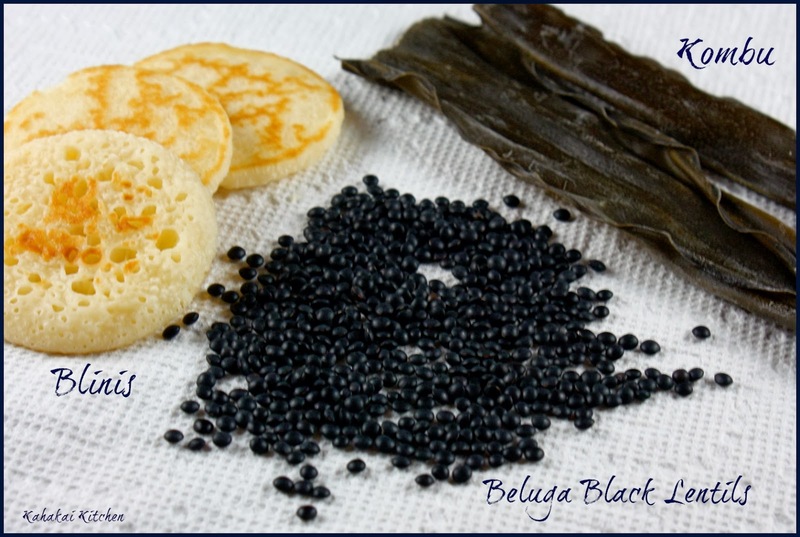 I am not a big caviar fan although I don't hate it and have eaten it a few times over the years and (purportedly) even partaken of the 'good stuff.' I guess fall somewhere in the middle of the Tom Hanks scale--in between spitting it out and making faces as in Big and selfishly scraping all of a caviar 'garnish' onto my own plate as in You've Got Mail. But, I do really like the little black lentils called "beluga" lentils for their resemblance to caviar. 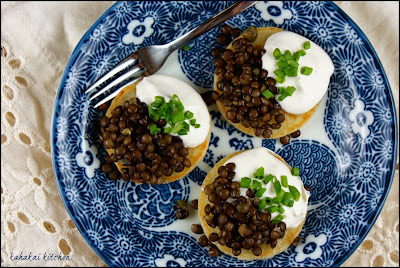 I thought it might be fun to do a vegan version of the dish with a cashew sour cream and the lentils. In the end, I got lazy and bought my blinis and since they have milk and eggs in them, it ends up as a vegetarian rather than a vegan dish. (There is not a lot of difficulty in making blini and one of the recipes I looked at for inspiration has a great vegan blini, however I simply did not have the time or inclination to locate buckwheat flour and 'futz' with making them this week--and the pre-made ones are much better looking than I am sure I would do!) Still these ended up being a fun, tasty and elegant little appetizer. In a small pan, combine lentils, water and kombu pieces and bring to a boil. Reduce heat to simmer, partially cover and cook until lentils are just tender, about 20 minutes. Refrigerate for an hour or two. Drain any excess liquid before assembling on blinis. Soak cashews overnight in a bowl of water. Drain and rinse. Place drained cashews into high-speed blender with lemon juice, vinegar and sea salt. Blend until completely smooth, scrapping down sides and adding additional water in small amounts as needed. Place in airtight container in fridge for an hour or two to blend flavors. Cashew cream will thicken/firm somewhat as it chills. I assembled my blinis (after lightly toasting my store-bought blinis) as Babette did with a small scoop of the lentils on one side and a scoop of the cashew sour cream on the other side but for easier snacking by hand, spreading the sour cream on first and topping them with the 'caviar' keeps the lentils from rolling off. ;-) I also added some finely chopped chives for color. Enjoy! Notes/Results: A great little bite with a good contrast of taste and texture. 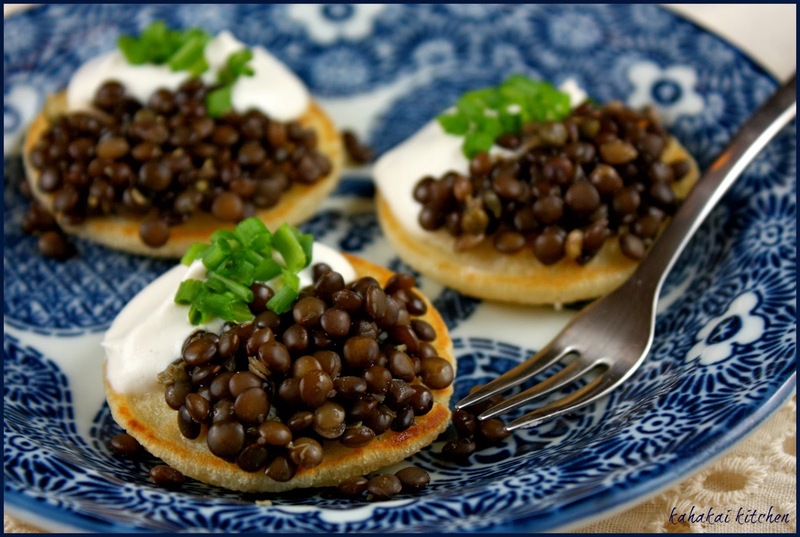 The lentils have a briny flavor from the kombu, capers and red vine vinegar which goes well with the creamy and just slightly tart cashew sour cream. Although these take a little advance prep--soaking the cashews, cooking and cooling the lentils--they go together in a snap (especially when you cheat and don't make your own blinis!) ;-) so you can quickly put them together for an easy addition to a party appetizer selection that both carnivores and veg-friendly guests would like. I would make them again. The deadline for February's Food 'N Flix is today--so if you missed this round, please join us for March when I'll be hosting the quirky 2006 comedy-drama-fantasy film "Stranger Than Fiction"--staring Will Ferrell, Maggie Gyllenhaal and Emma Thompson, here at Kahakai Kitchen. An announcement post will becoming soon. 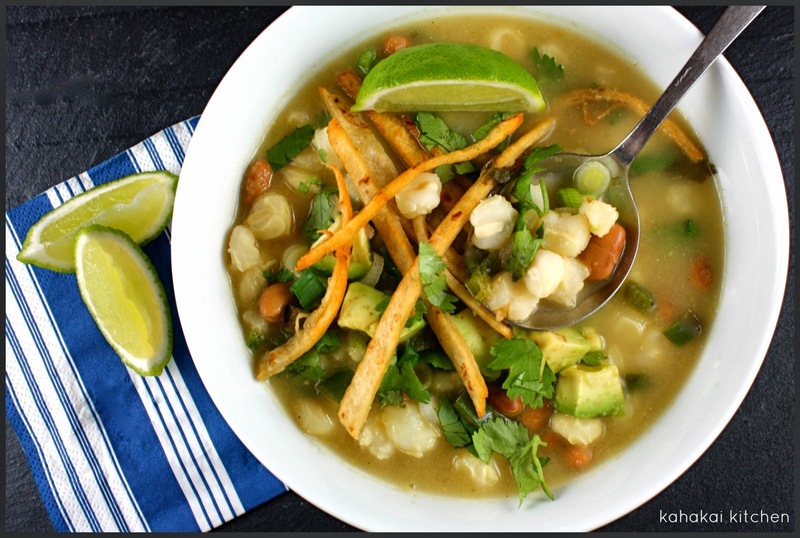 This Easiest Posole recipe comes from "It's All Good: Delicious, Easy Recipes That Will Make You Look Good and Feel Great" by Gwyneth Paltrow and Julia Turshen. This is the second of Gwyneth Paltrow's cookbooks and is based on recipes created for an elimination diet she went on based on health issues (no coffee, alcohol, dairy, sugar, shellfish, gluten or soy, no processed foods and only organic meats and fish). Wanting to still enjoy her food, Paltrow and chef/food writer/producer Julia Turshen came up with recipes that although she doesn't stick to everyday, since completing the diet, she still uses when she wants to eat healthier or revitalize. Although it's not a vegetarian or vegan cookbook, vegetables are predominant and recipes are coded as suitable for an elimination diet, vegan, or protein-packed and there are also menu suggestions for different weeks like A Body Builder Week, A Detox Week, A Family-Friendly Week, A Vegan Week, and a week of Just Great, Healthy, Everyday Eating. Although not looking for celebrity health advice--nor on any kind of elimination diet or detox, I am always looking for different veg-friendly healthy recipes that still taste great and the book seems to be full of them. There are a couple of non-processed condiment recipes in the back (Sriracha, Hoisin Sauce), that I am looking forward to trying too. There is usually one recipe in a new (to me) cookbook that catches my fancy right away when I look through it. 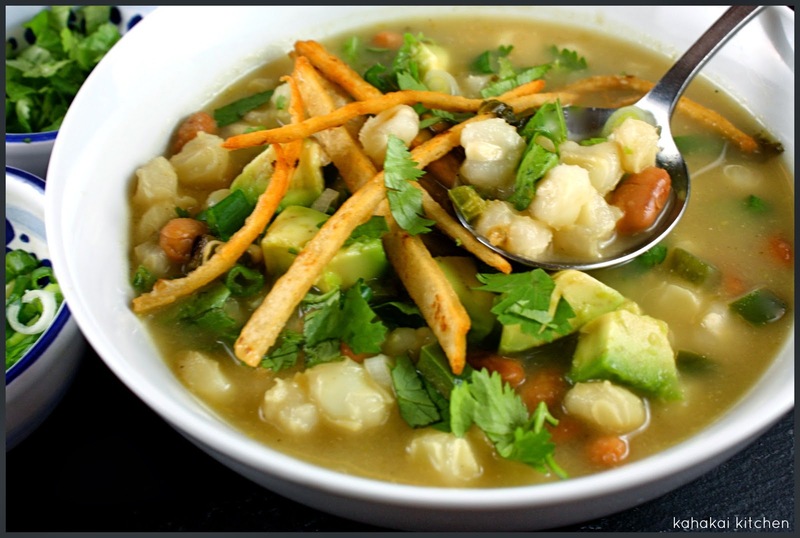 In this book it was the posole--a Mexican-style soup/stew made with hominy and usually some kind of meat like pork or chicken, chili peppers and garnishes. Easiest Posole is meat-free/vegan and of course being addicted to soup toppings, I knew I had to make it. I did make a few small changes (noted in red below)--mainly adding pinto beans for more substance and taking a turn from one my favorites--tortilla soup and adding corn tortilla strips crisped up in oil to the garnishes. 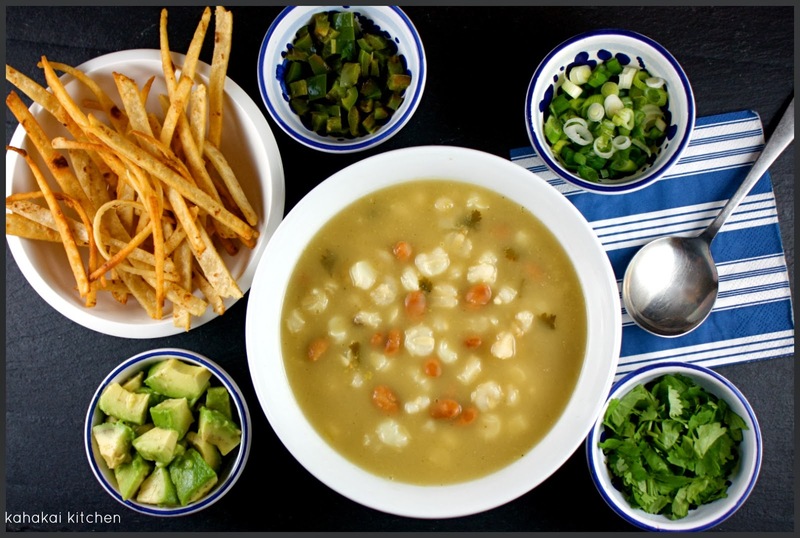 The result is a warming, tangy and slightly spicy bowl of soupy comfort topped with lots of goodies. 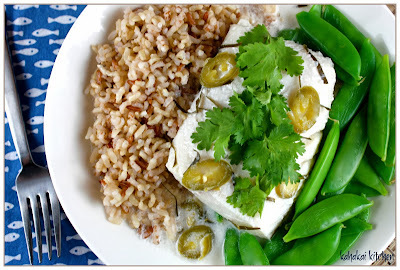 Gwyneth says, "Julia came up with this recipe on an unseasonably cold day one summer when I craved something warm and comforting that still had light, ever-so-spicy flavors. The various fresh vegetable garnishes allow everyone to customize their posole however they choose."